The U.S. Constitution outlines many powers granted to government, but few responsibilities of the governed. It implies that individuals have responsibility to run for public office and vote in elections if they qualify. But it doesn’t make us accountable for the quality of government. I think it’s time to add a Bill of Responsibilities to the U.S. Constitution. We cede some of our rights to government, but this does not entitle us to good government. We are responsible for good government. Personal accountability. Individuals are responsible for their actions, contracts, debts, and obligations, and for accepting the consequences of their actions. Community cooperation. Individuals are responsible for treating everyone with respect and fairness, and for teaching acceptance of peoples and lifestyles that do not harm others. Lawfulness commitment. Individuals are responsible for upholding the Constitution and reasonable rules and laws; and for reasonably cooperating with law enforcement to prevent and resolve crime. Government participation. Individuals are responsible for being informed about policies, laws, and public officials; and for participating in government, such as voting in elections, submitting testimony on proposed legislation, and/or engaging in public service. World legacy. Individuals are responsible for safe-guarding individual rights and freedoms; and for ensuring healthy, secure, and financially stable communities for future generations. Do you think there should be a Bill of Responsibilities in addition to a Bill of Rights? What responsibilities do you think we have as citizens? June is National Safety Month, and it’s a good time to remind everyone to Share Roads Safely with pedestrians, bicyclists, and motorcyclists. Make safe driving choices: be distraction free, avoid impairment, check your speed, rest up, and help teens and children. I thought I’d share a personal story about driving safely. Last year, I got a speeding ticket. I won’t make any excuses. I was speeding. It was a costly mistake only in terms of the fine, but it changed my driving habits as nothing else has done. Maybe having a child shifted my priorities. 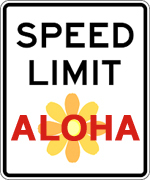 Maybe those “Drive Aloha” bumper stickers stuck in my mind. Maybe I’m just older. Today, I try to drive at the speed limit, which may annoy some drivers. I keep a bigger distance between me and the car in front of me – so that I have more time to react to sudden stops, and to let other cars merge into the lane. Those two small changes in my driving habits make me feel much more relaxed when I’m on the road. But before working on better driving habits, I had to go through five “stages” of getting a speeding ticket. How safe are your driving habits? Do you have a long commute to work or school every day? I admit that I’ve only gone to a handful of Neighborhood Board meetings, the first one out of curiosity, and the next few because there was a community issue that I wanted to learn more about. Sometimes I left early, but I felt confident that things were on track and reasonably sure that government representatives would follow up on the things they promised. Now the Honolulu Charter Review Commission is proposing to eliminate Neighborhood Boards, in a May 16, 2016 “Report of the Permitted Interaction Group: On Proposals Relating to Open Government.” The charter question would let voters decide the future of Neighborhood Boards. Do we need Neighborhood Boards? Honolulu’s Neighborhood Board System was created in 1973 to increase citizen participation in local government. The 33 Neighborhood Boards in Honolulu meet each month to discuss local issues and meet with government representatives. At the heart of the Neighborhood Boards are the 437 board members, who volunteer their time and energy to participate in government and give community members the opportunity to speak and be acknowledged. It’s hard to find data about participation in Neighborhood Boards. It seems that more people than ever want to be on the board – in 2015, 610 people volunteered to run for 437 seats, filling 418 seats. But communities overall seem less enthusiastic – attendance at monthly meetings seems to vary by community and whether there is an urgent issue that people feel passionate about. I don’t think low attendance is because people don’t care – I think it’s because we have less time to spend on local concerns, and rely on outspoken Board members to look out for community interests. There’s also the issue of not just open government, but accessible government. In July 2015, there were 998,714 residents of the City and County of Honolulu, according to the Hawaii State Department of Business, Economic Development, and Tourism. We have one mayor and only nine Honolulu councilmembers to represent almost a million residents. There are tremendous benefits when community members can meet government representatives face-to-face and when government representatives can be personally held accountable to the community. Letters and emails can be ignored or forgotten. It’s hard to demand unreasonable actions when a hard-working government representative is standing in front of you. It’s hard to hide behind the “office” when community members are standing in front of you. Are the alternatives sufficient? The Commission recommends substituting “television, Internet and email” for Neighborhood Boards, but I believe that electronic alternatives alone are inadequate sources of citizen participation. Television and Internet are passive mediums, in which viewers receive information but have limited opportunity to interact with speakers. Even if government incorporates phone call-ins, video conferencing, and “live chats,” it requires that viewers engage in real-time, rather than watching broadcasts at a later, more convenient time. Email is slightly more interactive, in that government and community representatives can respond directly; but email also mutes the sense of urgency and passion that people may feel about an issue, and it does not offer a sense of personal connection between government and citizens. We may not need a Neighborhood Board system, but I think we do need regular opportunities for community members to come face-to-face with government representatives and local businesses. Can we afford it? According to the Honolulu Charter Review Commission, the Neighborhood Commission Office supports 33 Neighborhood Boards with an average annual budget of $932k per year (around $28k per board per year). Most of the budget is spent for 17 paid employees who support both the Neighborhood Commission Office and Neighborhood Boards, by coordinating elections, publicizing meetings, attending meetings, writing meeting agendas and minutes, advising board members, writing newsletters, video-taping meetings, and coordinating training workshops. If the mayor and councilmembers were to host regular monthly or quarterly “town hall” meetings in each of the 33 neighborhood districts, it would cost significantly more than $1 million each year. And they would have much less time to do their “real” jobs. Yes, we could save $1 million if we eliminate Neighborhood Boards. But we could also lose out on the next generation of government leaders, who often gain experience on the Neighborhood Board before running for public office. It’s intimidating and extremely hard to run for an elected office if you don’t have any experience and no one knows your name. If we could enact term limits for Neighborhood Board members, we could increase citizen participation and encourage Board members to run for public office, giving voters more choices for government leaders. One last thought: in a representative democracy, does the fact that we don’t use a right to open government (Neighborhood Boards), or under-utilize it, mean that it can be taken away? Have you ever attended a Neighborhood Board meeting or served on the Board? If yes, why did you attend or volunteer? If not, what would community issue or problem would make you determined to attend the next meeting? My son just finished fourth grade at a Honolulu public school. He loved his enthusiastic, creative first-year teacher and opportunities to do more project-based work. That said, he still brought home a big stack of workbooks, worksheets, and loose papers. Over the year, he showed definite opinions about the projects and activities he wanted to do. 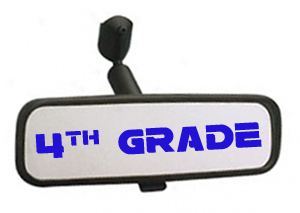 I’d like to share our fourth grade school year experience. How does it compare with your fourth grade memories? One day of articulation classes. Starting this year, all of the articulation classes (Art, Computer, Hawaiian, Library, Mandarin, Music, and PE) were scheduled on the same day. It was a good change. Students focused on classwork, without having to interrupt their studies to get ready for an enrichment class. Teachers had more time to plan lessons and collaborate with other teachers. Classroom economy. Students designed and voted on classroom money. They wrote job applications for classroom jobs (one month, my son was “hired” as a wiper). They earned money for doing their jobs and earning ClassDojo points. They paid “rent” for their desks or had the option to “buy” their desks for $300. At the end of the month, they could use extra money to buy an extra recess, homework pass, or other trinket. My son bought his desk early in the year and had a small wad of “cash” at the end of the year. Edmodo. My son’s class signed up for this kid-friendly, teacher-moderated online social network (Facebook lite). Parents could view their child’s student activity, classroom announcements, and discussions. The first question posed by the teacher: “If your first week of school was a story, what would be the main idea? Be creative!” My son’s response: “My first week of school was a ‘mystery’ and ‘adventure’ story. The main idea was that we met our new classmates and teacher.” Unfortunately, after the second quarter, the class stopped using Edmodo – but it was interesting while it lasted. ClassDojo. My son’s class also signed up for this real-time online point system that tracks student behavior – and it lasted intermittently throughout the school year. Teachers gave points to students for being on task, thinkers, knowledgeable, open-minded, helping others, and more. Each week, parents could see a summary of their child’s performance and even communicate with the teacher about their child’s progress. “I think [my teacher] gives out less points if you already bought your desk and have a lot of money,” my son confided. International Baccalaureate (IB) units. The six transdisciplinary IB units were thoughtful, well-designed, and challenging. The units are more project-based than textbook-based. For example, in the “Where We are in Place and Time” unit, students learned about Native Hawaiian navigation, met with Austin Kino from the Polynesian Voyaging Society, and had a video-conference with crew members aboard the Hokulea. In the “Sharing the Planet” unit, students researched how we can save Hawaii’s marine ecosystems and completed a final project. No Big Island trip. Grade 4 is the exciting Big Island trip. But with my son’s agreement, we decided to cancel the trip. At the time, Dengue Fever cases were still being reported, and our son is susceptible to mosquito bites (if there’s a mosquito around, it will find him). Though Dengue Fever cases did drop dramatically by the date of the trip, we decided not to second-guess ourselves – we made the best decision we could at the time. Unit tests, standardized tests, and more tests. In addition to “regular” unit tests (reading comprehension, spelling, science, math) STAR Reading tests, STAR Math tests, and the Smarter Balanced Assessment Consortium (SBAC) tests in Language Arts and Math, grade 4 offered an additional test: three rounds of the Hawaii State Assessment (HSA) in Science. My son complained that they had to spend two hours learning to use the online tools for the SBAC test. He thought it was a waste of time, and was glad that he missed one of 40-minute classes to go to an interview about his science fair project. Science fair. At my son’s school, the science fair was open to fourth and fifth graders. The school organized two planning workshops, regular check-ins with the science fair advisor, a field trip to see the Hawaii State Science and Engineering Fair, and a fun rocket-building wrap-up workshop. My son chose a project about mobile device batteries, and learned to manage his time, perform Internet research, use presentation software, and design a poster board. “I am definitely confident that I am ready for 5th grade. I learned a lot this year,” my son wrote in his writing journal at the end of the year. Do you have school-age children? How are expectations about student learning different from when you were in elementary school? What has been your experience with common core and standardized tests? Work harder than anyone else. Live right in your relationships with others. Accept that some success is luck. Robbie Alm, former First Hawaiian Bank and Hawaiian Electric executive, and president of the Collaborative Leaders Network, takes these three work principles seriously. They are the foundation of a great leader. 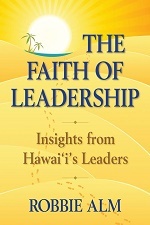 In “The Faith of Leadership: Insights from Hawaii’s Leaders” (2014), Alm discusses eight essential aspects of leadership that he has experienced throughout his career and observed in great leaders. With a conversational tone and encouraging words, he shares anecdotes and best practices of leaders who have made a positive impact on their organizations and in the lives of others. Listen respectfully. Great listening is a deliberate and conscious physical and mental activity. Make others feel as comfortable and possible (such as meeting at their desk/office, removing physical barriers, and giving them your complete attention). Leave your desk and talk to people you wouldn’t usually meet. Work with resistance to change. Leaders need to reduce the level of anxiety that goes with change and communicate clearly the benefits and expectations of change. Enlist employees to make a change. Listen to long-term staff. Let them know you value their views and that you ultimately accept responsibility for risks. Keep your perspective. Respect other people’s perspectives and ask where they think they could improve – personally or in the department. Encourage independent voices. Surround yourself with independent voices and different perspectives. Bring in people outside your industry or appoint a “10th man” (someone who advocates for the opposite position). Integrity – walk the talk. Integrity is a lifestyle; it is right behavior whether or not anyone is watching. Live Aloha. Do things that better your community. Commit to Live Aloha, a community action program created in 1993 that shows how small actions can have a big impact. How can we Live Aloha? Alm offers 12 small things that we can all do: 1) Hold the door, hold the elevator. 2) Pick up litter. 3) Respect your elders and children. 4) Drive with courtesy. 5) Plant something. 6) Create smiles. 7) Get out and enjoy nature. 8) Attend an event of another culture. 9) Share with your neighbors. 10) Return your shopping carts. 11) Make a list of your own. 12) Leave places better than you find them. Alm concludes with reminders that leadership is hard and not for everyone. What you do may be overlooked, ignored, or forgotten, and you may not see the result of what you do. But you have to believe that you are doing the right thing and that what you do will make a difference. You are currently browsing the Better Hawaii weblog archives for June 2016.